If the cost of flour is higher than the price of bread, what should a baker do? Chinese property developers are choosing to buy more flour. 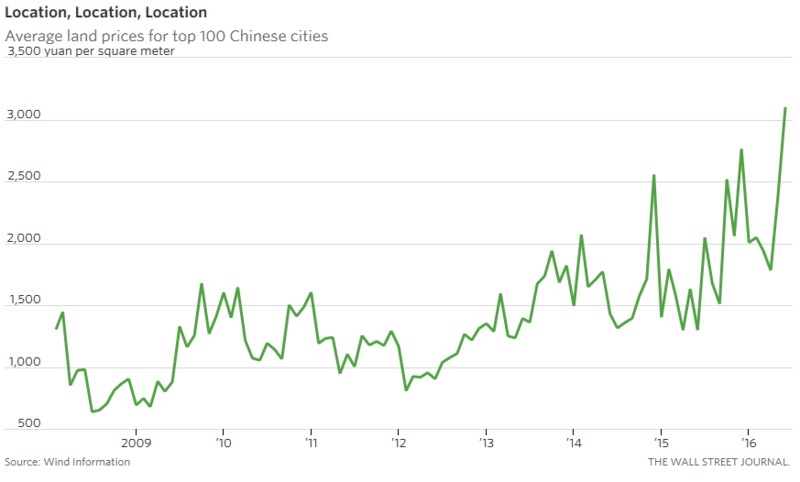 Prices for land, the main ingredient of the property world, have hit record highs in auctions this year in many Chinese cities. 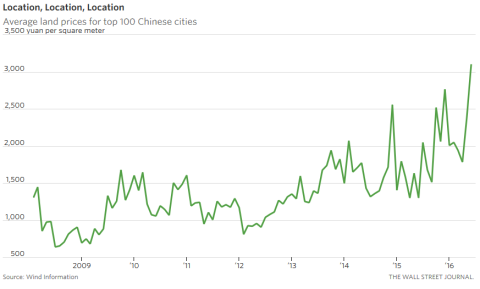 The average land price per square meter for the top 100 cities in the first five months of this year jumped nearly 50% from the same period last year, according to Wind Information. Some land prices are even higher than housing prices nearby. State-owned developer Poly Real Estate, for instance, bought a piece of land in a Shanghai suburb for 5.5 billion yuan ($835.5 million) last month. This translates to roughly 44,000 yuan per square meter of buildable space. Houses in the region meanwhile go for around 40,000 yuan per square meter. After taking into account construction costs, taxes and other expenses, property prices would have to nearly double for the developer to make money. Prime land in the biggest cities always costs a lot, but increasingly the voracious buyers are showing up in less prime locations and smaller cities. In Suzhou, a city near Shanghai, with a population of 1.1 million, land sales in the first five months of this year have already exceeded the total of last year. And average prices have doubled. Most of the buyers of the most expensive parcels are state-owned enterprises. A property subsidiary of China Gezhouba Group, a state-owned builder of power plants and dams, spent 3.3 billion yuan last month to buy the most expensive land, in terms of price per square meter, in Nanjing. 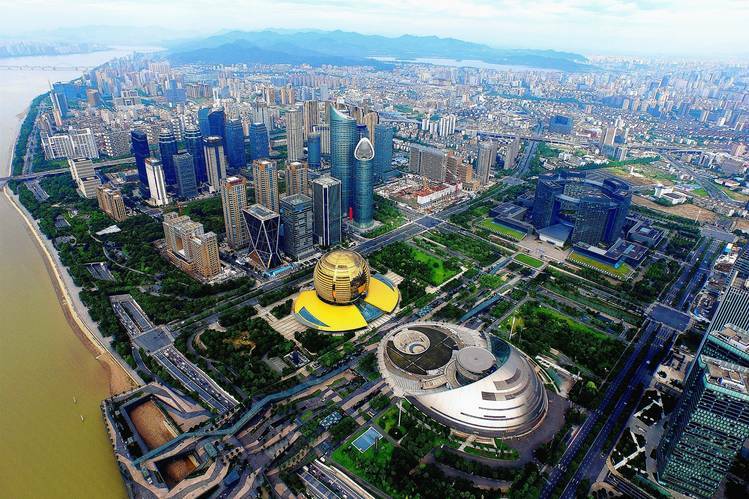 Another state dam construction company, Power Construction Corp. of China, snapped up a piece of land in China’s bubbliest property market, the southern metropolis of Shenzhen, for 8.3 billion yuan. Cinda Real Estate, a subsidiary of state-owned “bad bank” China Cinda Asset Management, has splurged on at least 35 billion yuan of land over the past year, even though the market value of the company, listed in Shanghai, is just 7.3 billion yuan. To fund the purchases, Cinda’s net debt has swelled to more than three times its shareholders’ equity. It still managed to raise 3 billion yuan last month in a bond financing at 5.5%, mostly because of its state backing. The domestic bond market and growth in asset-backed securities have made financing easier for developers, causing companies to chase whatever assets they can. Continuing reforms of state-owned enterprises could also be a trigger, as these firms have incentives to inflate their balance sheets to gain clout in consolidation talks. For some which have already invested heavily in real estate, keeping land prices high makes sense. Instead of overpaying, developers should do as the baker would and stop making bread.